24 Mar, 2013 in Flicker and Super 8 by G.
As part of the Flicker: Artists & Super 8 exhibition in Bury St Edmunds, we’ve invited a number of practitioners to run hands-on workshops. Over the weekend of 16/17 February it was the turn of Martha Jurksaitis, founder of Cherry Kino in Leeds, to lead a group that shot and developed films in a darkroom under her expert supervision. We caught up with Martha at Abbeygate Picturehouse on the Saturday evening and interviewed her at length about the European DIY developing scene, the origins of Cherry Kino and the attractions of playing with film chemistry. Listen to the interview (MP3, 28 minutes, 25MB). 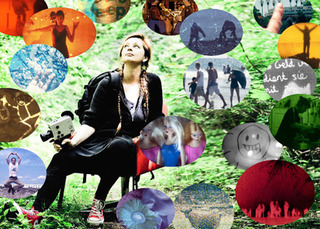 Martha curates work under the banner of “Wondermental Cinema” and you can follow her blog. In the interview she mentions the Hamburg supplier Wittner and the new ADOX monochrome film. A night of retro film footage, social historical images with musical treats. Also the opportunity to bring along any film you have, there will be spare projectors and hands on experience to show you how. Or just come along and enjoy the show. There will be plenty of popcorn too! To mark the final evening of Flicker: Artists and Super 8 we present a live performance by Chris Mizsak and Tony Scott from Bell Art Laboratories. South uses live spoken word, sound and Super 8 projections to tell the story of two characters, a saint and a biker, who travel through different landscapes and time scales, eventually reaching the same destination. Shot and edited entirely on Super 8mm, the work is presented as a triptych of three projected films, exploring the perspectives of the two characters within the landscape itself. Smiths Row and the Cambridge Super 8 Group in association with Abbeygate Picturehouse in Bury St Edmunds near Cambridge will present a new work by Swiss art-collective MOBILESKINO. 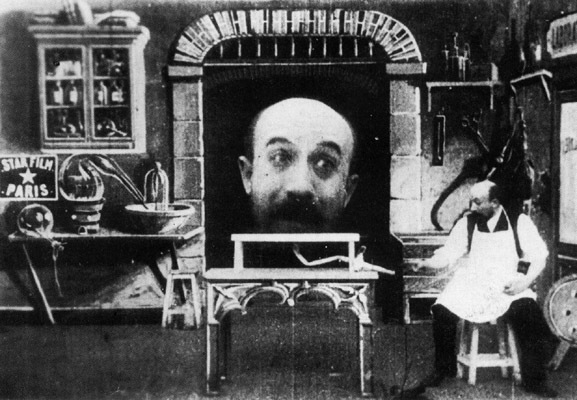 La Tête Infernale is a film installation that celebrates the early cinema trickery of French pioneer Georges Méliès. 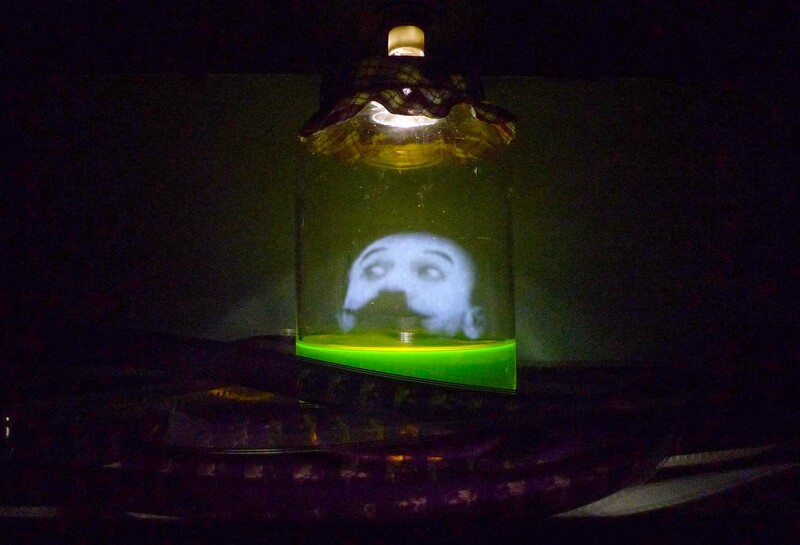 In the tradition of the Kinetoscope, viewers can look inside a peephole and see a 3D effect moving-image of Méliès’ head preserved in a glass bottle. The illusion is created entirely with 19th century stage magic tricks and Super 8 film; and without the use of CGI or any hidden digital components. MOBILESKINO is a collective of artists, animators, film-technicians and sound designers. The group’s projects occupy the space between digital and analogue media. Conducting research in the field of interactive environments, the group combines mechanical and electronic technologies to build art machines and installations. Méliès was an illusionist and pioneer in early cinema special effects such as the ‘stop trick’ and hand colouring. His most famous film A Trip to the Moon (1902) is regarded as the first science fiction movie. Dagie Brundert has a growing reputation as a Super 8 alchemist. We are lucky to have her visit us in Bury St. Edmunds from Berlin to lead this unique workshop in Super 8 film-making and processing using 3 different recipes using low cost domestic ingredients such as coffee, tea and red wine or beer. Derek Jarman (1942-1994) was one of the most important figures in postwar 20th Century British cinema, though over the course of a remarkable career,he maintained a prolific creative output which overlapped into many other realms including stage design, painting, writing and gardening. We are delighted to welcome the acclaimed director’s long time friend and collaborator James Mackay to introduce a rare screening of Glitterbug (1994) – a montage of Jarman’s Super 8 shorts and personal footage set to an original soundtrack by Brian Eno. After the screening, Tony Clarke from the Cambridge Super 8 Group will lead a short conversation and Q&A with James Mackay. Open screen. 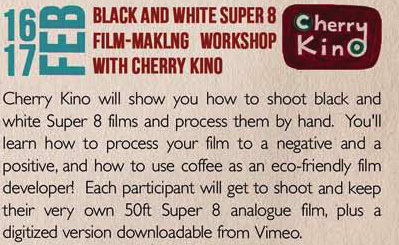 You may have some Super 8 films you made, bring them along. 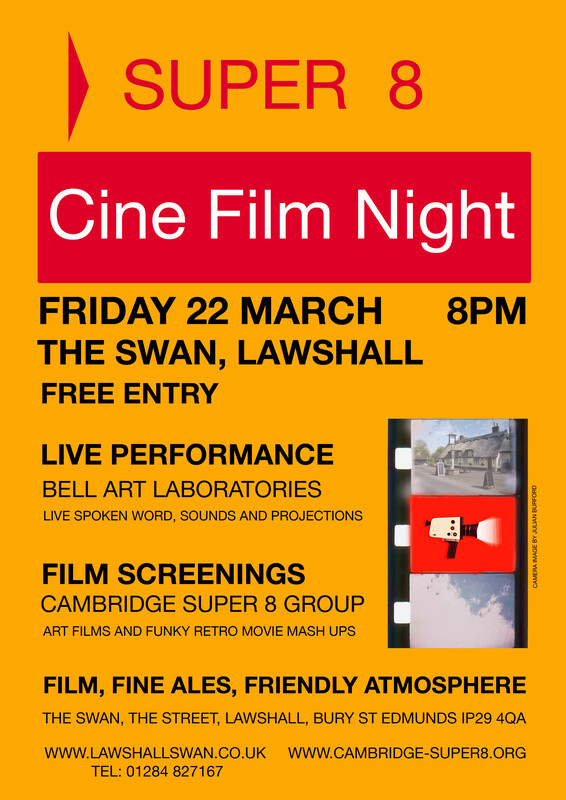 We will show films from our BnW workshop and from our Cambridge Super 8 collection. Come and join us for a nice and relaxing Sunday evening. Meet some of the people who made the films at the screening. The season kicks off with State of the Eight. This documentary double-bill will examine the impact and continued allure of Super 8 from the 1980s through to today. Super Eight / 1986 | UK | 60 mins. Dir: Jo Comino. Originally commissioned for and screened as part of the Eleventh Hour season on Channel 4 Television, Super Eight offers a unique insight into the world of the small film format during the 1980s. Super 8: Mon Amour / 2012 | France | 52 mins | French Language (English Subtitles) Dir: Rémy Batteault. A Super 8 camera itself becomes the narrator’s voice in this whimsical, fantasy documentary about filmmakers and their love of the Super 8 format. We are delighted to welcome director Jo Comino for this special event. Both screenings will be preceded by a short introduction and followed by a Q&A session. 13 films were made around one of the following themes: the Olympic flame, sports or people featured in the Olympics or Paralympics. The films were shot as part of a challenge and shown on the day of visit of Olympic flame in Cambridge. Meet some of the people who made the films at the end of the screening. Tony Clarke from the Cambridge Super 8 Group is a fountain of knowledge when it comes to the subject of Super 8! 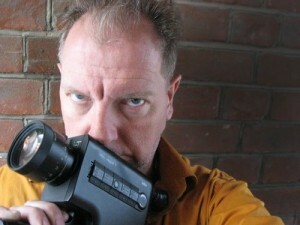 Come and hear him talk about the history of Super 8 film and what makes it so special.